Computers have played a massive role in changing the way we live over the last couple of decades. They are no longer possessions of the privileged but are rapidly becoming inexpensive, everyday commodities. This means that computers are now interwoven into almost every aspect of our lives. As the size of computers reduces, the potential it delivers expands. In the short history of our relationship with computers, our gestures have become less mechanical from point-and-click to more intuitive – fundamentally performing more natural gestures where we tap, pinch and swipe our way into the machine. We have thus far migrated from the keyboard to touch screen; and now, new interfaces are shifting towards the subconscious where we are just beginning to communicate with technology on our own terms. I happen to epitomise the Gen-Y generation were we were the first to truly grow up with computers in our homes and throughout my life (thus far), I have seen the characteristics that make us human manifests in our relationship with technology. In the last decade or so, we have been living in an increasingly technology-reliant world – where we have become highly techno-dependent. We are moving towards an integrated and co-operative process between user and technology that take us effortlessly from thought, instruction to result. The interfaces of tomorrow will require no translation – human demand will simply become machine command. Like anything “new” these days, the underlying concept has always existed in the creative works of science fiction writers for decades – I have grown up with Hollywood movies that have portrayed machines interacting with humans such as HAL from Space Odyssey, KITT from Knight Rider and COMPUTER on-board the Star Trek Enterprise. Looking beyond the theatrical and dramatic value of these ideas, the reality is simple — they have always symbolised our desire for trusted machine assistants that can help make our lives easier. Over the last few years, I have been harping on the potential and the possibilities of voice-enabled interfaces; in hindsight it might have been premature. I believe timing is everything and we are starting to see this concept mature and finally take off since the first conception of Siri in 2011. In some sense the smartphone is starting to work this way. We have been unconsciously using elements of Artificial Intelligence while on our mobile devices. The elements of technology and ecosystem are already here – offering us recommendations, automatic notifications and scheduling alerts we subscribe to. Virtual assistants can further help unify these platforms of search, social media and e-commerce to help, connect and entertain. The rapid maturation of technologies that enable free-form interaction such as natural language processing and speech recognition have vastly improved, to the point of gaining real adoption in many applications today. 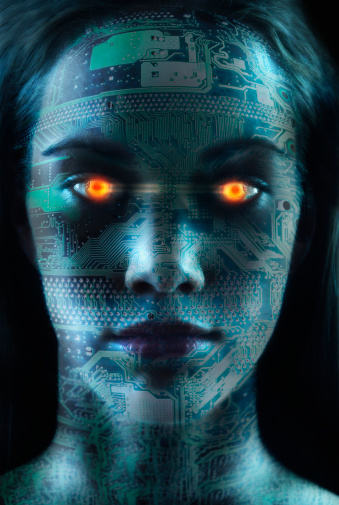 We are starting to see “human-centric computing” really take shape. Siri was launched on the iPhone 4S as more of an intelligent virtual assistant than a searching tool – and admittedly so Steve Jobs had made it clear Apple had slightly different plans for Siri. Evident at the 2010 All Things D’s D8 conference, Steve Jobs had reportedly said “Siri’s not a search company. They’re an AI company. We have no plans to go into the search business. We don’t care about it. 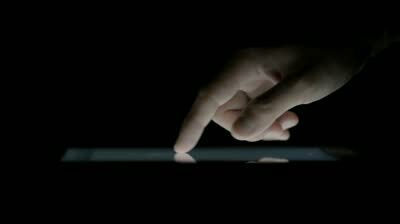 Other people do it well.” It was primarily designed to set reminders, send text messages, make appointments, etc. 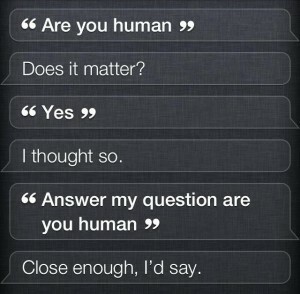 Superficially, Siri had all the makings of greatness – but it had 2 major flaws. 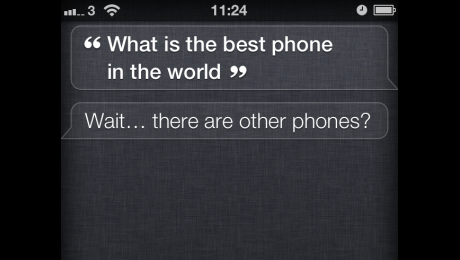 Firstly, Siri wasn’t (and still isn’t) available cross-platform, only on iOS. Secondly, it lacks the backing of a powerful search engine. But what it lacks, it sure makes up for in personality and I have no doubt that Apple will add better search features to Siri over time. At a fundamental level, Google Now combines the best of Google: a highly sophisticated speech-recognition technology and semantic search using Google’s Knowledge Graph to put personally-relevant information just one step away from almost anything users are doing on their device. 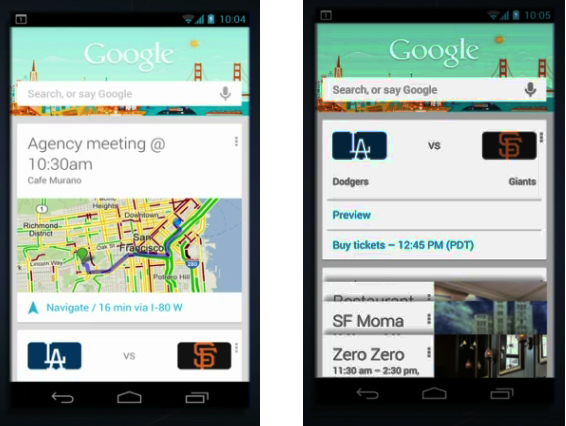 However, the true power lies when Google Now is a supplement to Siri, rather than a replacement. As an iPhone user, Google Now is a wonderful companion for the tasks I can’t accomplish with a simple voice search. 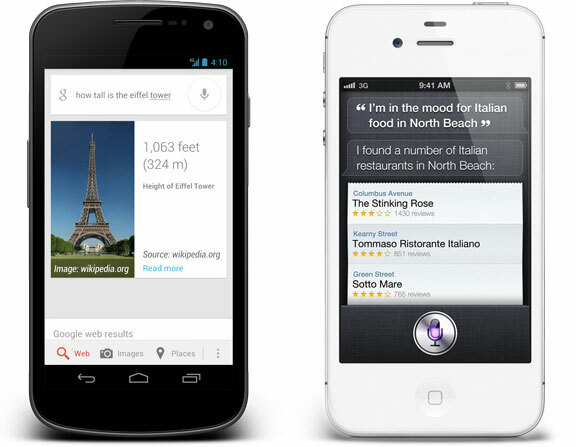 This makes Google Now and Siri exactly what I want in a virtual assistant. More importantly, both Apple and Google are constantly working on improving their voice recognition systems. One thing is for sure, with the emerging trend of wearable technology and the Internet of Things, we will likely be speaking to our devices more in the future. Though, voice recognition software has come a long way, there are many things to still be perfected. Increasingly virtual assistants will affect both our online and offline life in the future. Today’s simpler apps are showing glimpses of what is to come, but the really interesting bits have yet to come. Previous Previous post: Is native advertising a Mobile salvation? Next Next post: The world around you is not what it seems.